The Planet of the Apes ReAction Wave 2 Figures are available now directly from Super 7. The 3.75″ scale figures,which span numerous films from the original series, are joined by a 5″ tall version of the Lawgiver statue. While the figures are priced at $15, the Lawgiver is priced at $20. You can order the figures by Clicking Here. 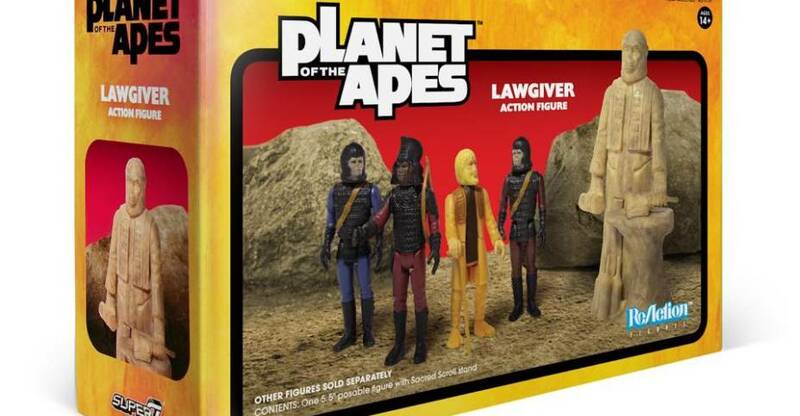 “The spirit of the Lawgiver lives.” AVAILABLE NOW: The Super7 x Planet of the Apes (Original Movies) ReAction Figures world expands with the Wave 2 assortment! This new 3.75-inch collection includes Astronaut Cornelius (from Escape from the Planet of The Apes), General Aldo (from Battle for the Planet of the Apes), Mendez XXVI (from Beneath the Planet of the Apes), Gorilla Soldier – Patrolman (from Planet of the Apes), Gorilla Soldier – Hunter (from Planet of the Apes), and the Lawgiver 5.75-inch Statue (from Beneath the Planet of the Apes)! The carded figures feature new and original card art by Ed Repka and the Lawgiver comes in retro-style packaging and all of the figures come with accessories. We have our first look at the Planet of the Apes ReAction Figures Wave 2 from Super 7. This assortment goes up for sale on Wednesday, February 20th. 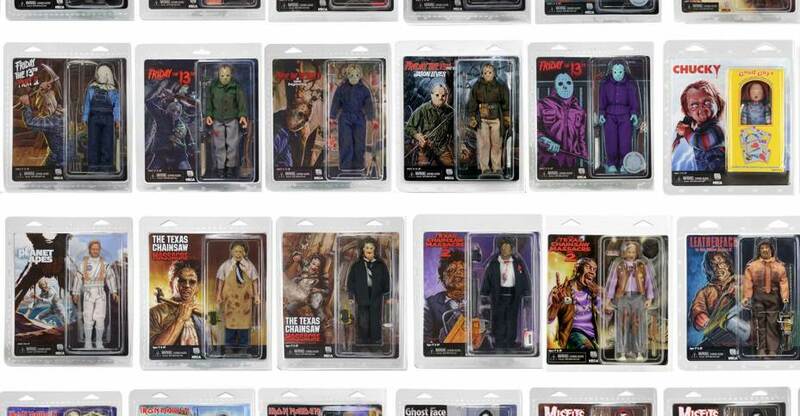 The assortment includes a mix of figures from throughout the entire original film series. Not only are their 3.75″ figures, but a 5.75″ tall Lawgiver statue. Check out the info below, and see the photos by clickign the headline of the story. NECA has posted up a new shot of their upcoming Conquest of the Planet of the Apes Gorilla. 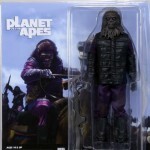 The 7″ scale figure will come with a few accessories from the apes uprising at the end of the film. Included will be a clever, a rifle, a machete, and a SWAT shield. This figure will be part of their Classic Planet of the Apes Series 3. 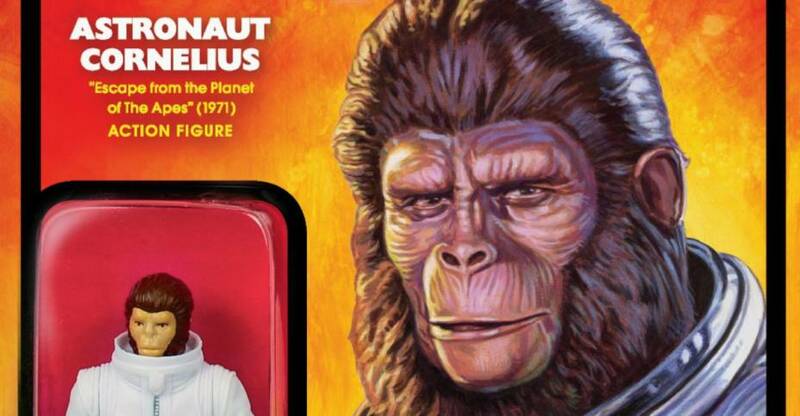 NECA has posted some artwork from the packaging for their Classic Planet of the Apes Series 3. The images show Caesar and a Gorilla Soldier from Conquest of the Planet of the Apes. We’ll have more on the Classic Planet of the Apes line as it becomes available. Read on to check out the art. NECA continues their retro Mego Style Planet of the Apes line up with the reveal of a new 8″ Gorilla Soldier. The figure, which is scheduled to be released next month, will be the second Mego Style Classic Planet of the Apes Figure, after the newly released George Taylor figure. You can see an in-package photo after the jump. NECA has posted up detailed photos of their upcoming Toys “R” Us Exclusive Classic Planet of the Apes Gorilla Soldier 2-Pack. The set should be hitting shelves at Toys “R” Us stores sometime in November. Included are two 7″ scale Gorilla Soldiers with removable backpacks, clubs, human catchers, a bayonet rifle, a submachine gun, and interchangeable hands. Pre-orders are live at Toysrus.com. Check out the official photo of the upcoming figures in the Gorilla Soldier 2-Pack posted by NECA. This Classic Planet of the Apes Infantry Set will be a Toys “R” Us Exclusive. It should be hitting shelves at TRU sometime in November. Included are two Gorilla Soldiers with human catchers, rifles, clubs and alternate hands. See the new image after the jump.